Earlier this week I got the chance to stop by a few local thrift stores. Thrifting is something I used to do with regularity, but after noticing that with the downturn of the economy the stores got more crowded and my finds weren't as great, so I stopped visiting. Things still aren't like they used to be, but I was able to find a few things. At my first stop I found these two fitted sheets. I don't think I have any of this pattern, so I had to have them. Lucky for me, they were 50% off, so I spent a grand total of $2.11 for them. 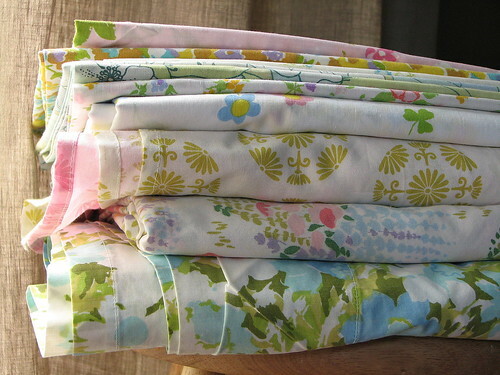 Lily requested a night gown recently, so I think I'll make the girls matching night gowns out of these. Next, I went to the store I frequent most, but there wasn't much to be found. I did stock up on old sewing patterns. I like to use the tissue paper in these patterns for packing material. Most of the patterns I bought are from the 80's, but I couldn't pass this one up - love the image on the envelope. I've been collecting these vintage envelopes for a while. I'm not sure what I'll do with them, but I sure do love to look at them. Each pattern was $0.25. I almost didn't stop at the last store, but I'm glad I did. 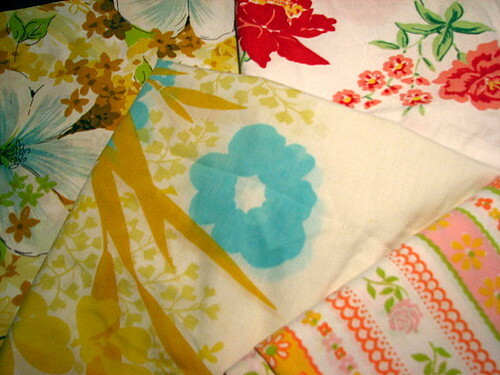 I found 2 pillowcases, which will be dresses for Ava, and this set of 6 linen napkins. I love these napkins! They may be making their way onto a purse in some fashion. I went on this excursion expecting to find nothing, but ended up pleasantly surprised (and spent less than $10). You can't beat that! Ta-da (almost)! 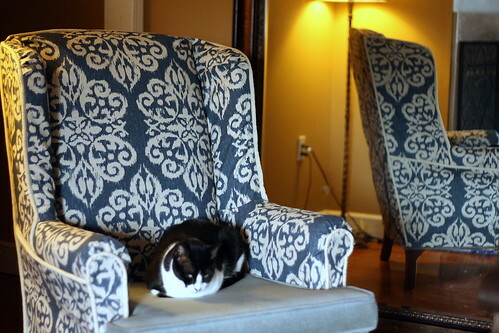 This weekend I got hot & heavy in slipcover making. Sewing home dec stuff is not my favorite thing in the world to make, but when I want it bad enough, I get busy. It took me all. weekend. long. In the past when I've made slipcovers, I just drape the fabric and dive right in. Not this time. I took my time and made a pattern from muslin, which allowed me to center the design and deal with less bulk. I think this is my best slipcover yet!! I totally surprised myself on this one. I even used cording, which is something I hate to fool with. I would have finished, but I ran out of that darned cording. I suppose that was okay considering that by that time I was pooped. All I have left to do is the seat cushion and the bottom hem, which I'm thinking about binding in the same fabric as the cording. 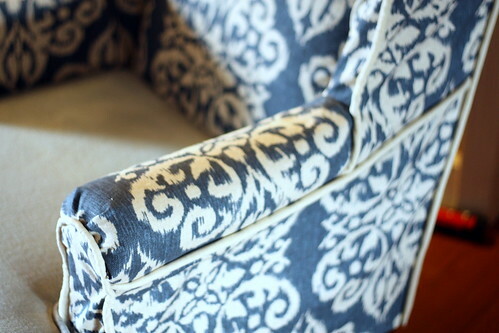 Isn't it amazing how fabric can totally transform something? Last week I made a stop by the thrift store. Since the downturn in the economy, my thrifting hasn't been too productive. My latest trip was no different. 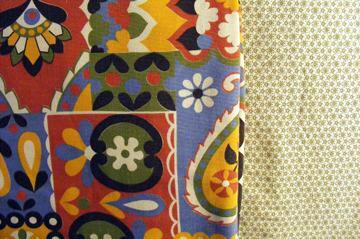 I found a couple of less than exciting pillowcases and a grab bag of random fabric. 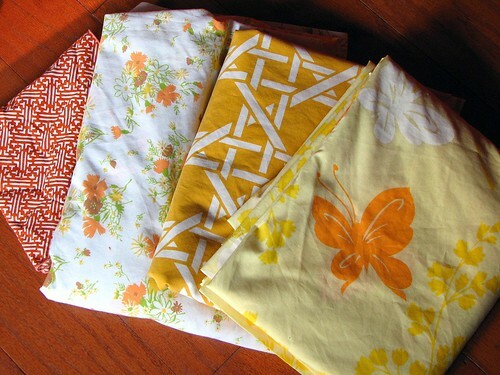 The bag of fabric had two ugly prints that I had no interest in (both icky synthetic stuff), but there were a few folded up pieces of white fabric that I thought may be interesting. On one, I could see a hint of blue, like it was some sort of embroidery design. It was only $1.48, so I bought it just so that I could see that that blue was (the bag was stapled shut)- for all I knew, it could have been some 80's country "bless this house" something or other! I walked out of the thrift store spending less than $3 and threw the bag in the back of my van. I forgot all about it until I found the bag while cleaning up yesterday. Wow. What a little treasure I found! That little bit of blue turned out to be 4 pillowcase tubes with a stamped peacock embroidery design and a large square piece of fabric (at least 54") with another stamped embroidery design. SCORE! I've never done much embroidery, but I'd like to try. Being unfamiliar with this sort of thing, does anyone know if these can be laundered? I'd like to wash the ickiness off them before I start embroidering, but I'm afraid that the embroidery design will wash off. Can you imagine how beautiful that peacock could be? I can only dream that if I ever get around to completing this embroidery, my girls will fight over who gets them when I'm gone. And that square, what should it be? Do you think it was meant for a tablecloth? Oh, the possibilities! Such a pleasant surprise for only $1.48. Aww what the heck, there's no rule that says I can only talk about thirifting finds on Thursday, is there? These were picked up over the course of a few weeks here and there. I just got around to getting them all washed this weekend, so here they are. Ah, the yellows, aren't they lovely? I happened to find these after Tracy mentioned that this upcoming week will be yellow week. I love that butterfly one and that dark gold one next to it. That burnt orange piece on the end is a napkin. I was bummed that there was only one of them. Some of the ones above are repeats of what I already have. 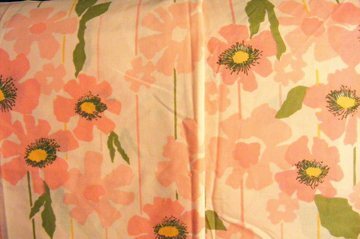 I'm pretty sure I have the matching sheet to that pink pillowcase, and those daisies - that's a full set including the flat & fitted sheet. I plan to use that one on the girls' bed when we get them one. 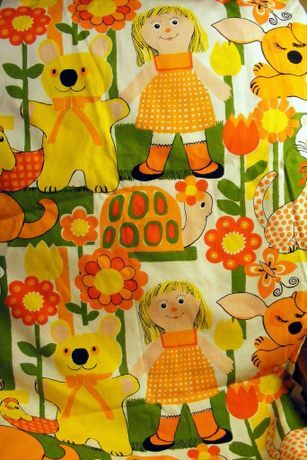 When we do put the girls together in one bed, I'd like to make them a quilt from these sheets. It's been on my mind lately. 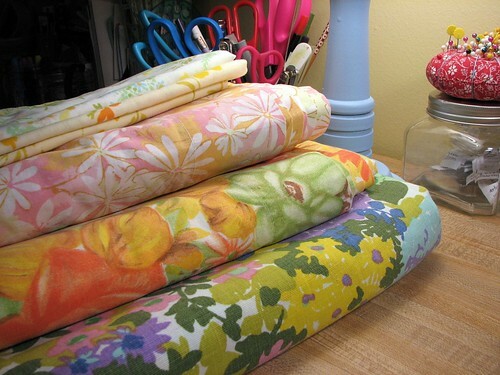 I think that lovely stack of fat quarters from the Vintage Sheet Patchwork Swap got the wheels turning. Aren't they yummy? Thanks for putting together such a great swap, Elizabeth. I only wish I would have sent in more (but I'm sure you don't -hee hee)!! I think I need an intervention. 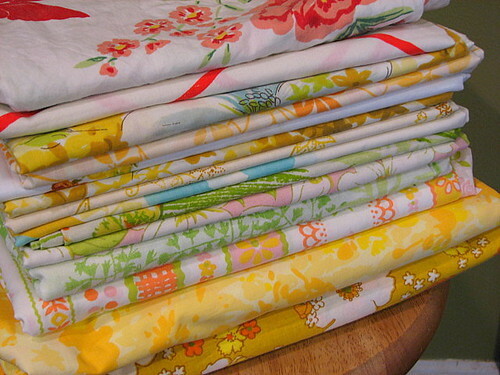 I know I already have plenty of thrifted vintage linens collecting dust, but look what I brought home this week. I couldn't resist! One of these days I'll get around to doing something with them. Well, there is something I can do with them right now. 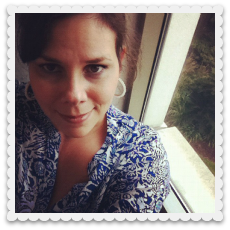 Have you heard about Lisa's Summer Skirt Sheet Swap? Go on, check it out. I signed up. Doesn't it sound like fun? I couldn't stand it any longer - I had to get out of the house (and I had to spend some money). What better thing to do than to pop into a thrift store? Wow, I really scored today! 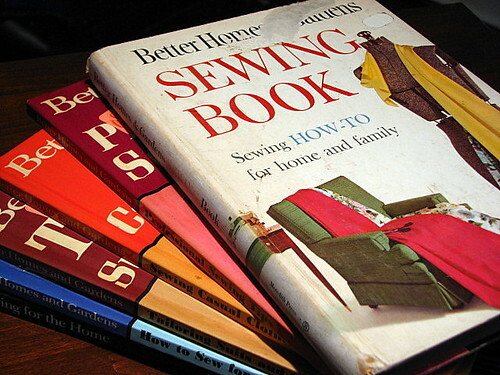 I found oodles of vintage pillowcases, vintage sheets, and these great old sewing books. I *love* these books! I always check the book section, but this was the first time I ever found anything I wanted. 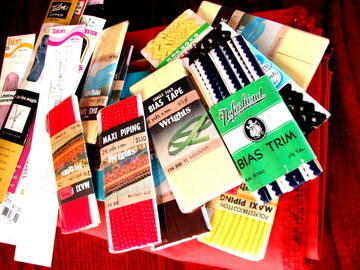 These will be a nice addition to my collection of sewing books. 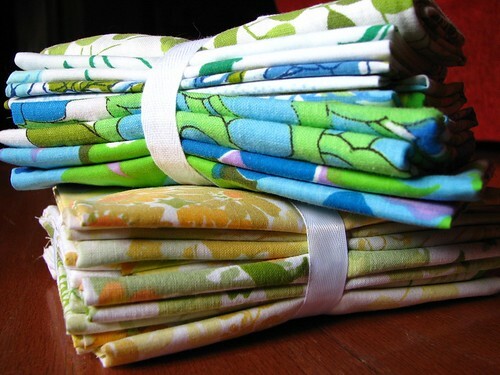 I promise, this year I am going to do something with all the fabulous linens I've been collecting. 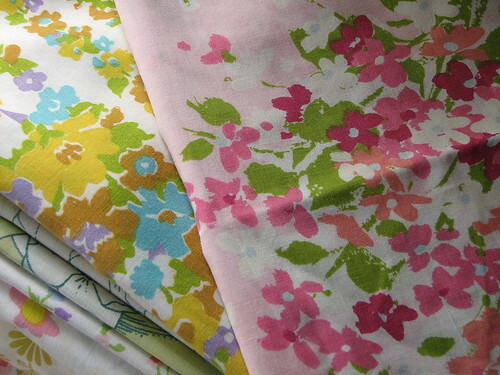 Right now I'm envisioning dresses for Ava, tops for me & Lily, and a whole line of springy, girly handbags. I should probably start working on that now, as spring will be here before we know it. 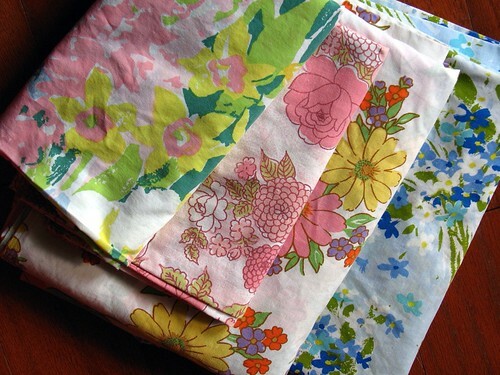 Speaking of vintage linens, have you heard about the Handmade Parade's Vintage Pillowcase Challenge? Go check out the details and put your thinking caps on. You have until the middle of February to enter, so get busy! 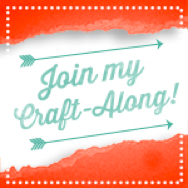 Oh, and if the thrill of a challenge isn't motivation enough, the grand prize is a $50 gift certificate to Sew, Mama, Sew, Reprodepot or Superbuzzy. How awesome is that? I can't wait to see all the wonderful ideas this challenge will surely produce! 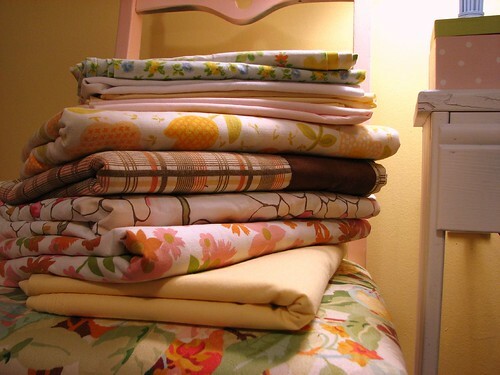 One more thing - the grand total for my 11 pillowcases, 3 sheets, and 5 books - $15. Not bad. Nothing special, just the usual: sheets & pillow cases. (gosh, I've been boring lately!) I'm not complaining, I rather like them. 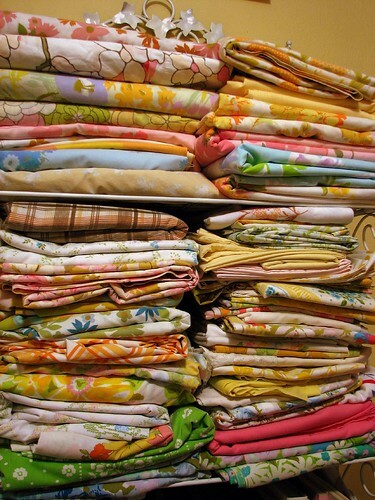 One of these days I'll think of something to do with all these linens. Until then, I'll take pleasure in looking at my beautiful stacks full of possibility. I didn't plan on going to the thrift store today. My plan was to stop in at the yarn shop to pick up some circular needles and some yarn to start on a hat. You can imagine my surprise when there was a "For Lease" sign in front of the store and a note on the door. I pulled in to read the note. Thankfully, they're not closing, but moving to a new location. Whew! I was relieved, but mad because I couldn't buy anything!! So, with shopping on my mind, I went to the thrift store. I didn't do as well as usual, but it wasn't bad. 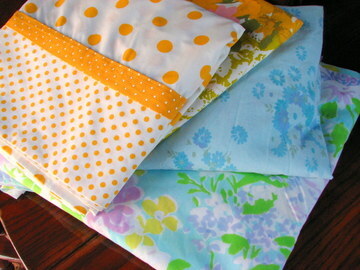 Pictured above are two sheets and three pillowcases (there are 2 of the polka dots). Better than the linens was this big lot of trims and zippers. A few of these are really cool, like that navy & white rick-rackish bias trim right on top. All these are sitting on a 4 yard piece of rust colored twill, which was a steal. 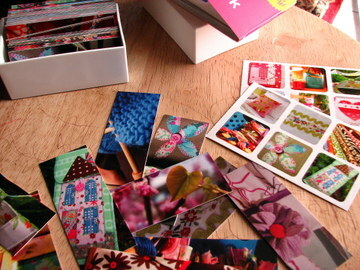 I haven't only been spending my cash on thrift stuff, I also received my new MOO cards and stickers this week. I love MOO! This is my second set of cards, my first set of stickers. They both turned out great. Okay, I think I've spent enough moolah on myself this week. Shhhh, don't tell Matt!! What he doesn't know won't hurt him. As usual, my recent thrifting trip did not disappoint! I tell ya, I'm beginning to fear that my good luck streak will end. Until it does, I'm going to milk it for all it's worth!! I like the floral the best. I thought Lily might like the other (she does). The curtain fabric is a bit faded, but it's still nice. I'm sure it would make a great bag lining. 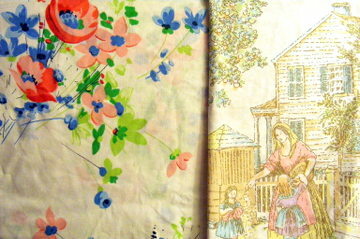 When I saw the tan fabric on the right I immediately thought it would be great as a swing top for Ava. The best part about this is that it's a set - a full flat sheet along with two pillowcases. I love that soft pink. 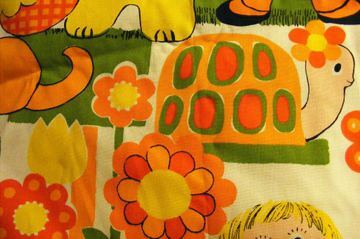 Vintage kiddy fabric!!! It was so fabulously hideous, I couldn't pass it up! You can't really tell from the photo, but this is a BIG print. It's even louder in person (the incandescent light softens it a bit). I have no clue what I'm going to do with this. I love this little (big) snail, so cute! And the flowers? Love them all!! Okay, you can all be jealous now, hee hee! !